A new curated work space offers Miami based businesses the opportunity to thrive through co-creation. In the world of small business and startups, there has been significant change in how companies choose to set up shop. 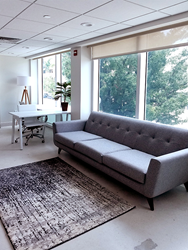 With there being considerable options in the marketplace for entrepreneurs to house their businesses, many have gravitated to Co-working to keep costs low, while still being able to provide their client base with a brick and mortar location. Sandhouse opened it's flagship location on Sunset Blvd in Hollywood California in 2017. It’s considerable success prompted seasoned developer Gerstein to look to other markets that were seeing small business and startup numbers grow. After her August 2018 Purchase of 820 West 41st , a 20,000 sq ft building in the heart of Miami Beach, Gerstein went full speed ahead to revamp and build out a stunning facility that allows people to focus on work while offering them a community to foster growth and development. Sandhouse is a boutique co-working space that centers around collaboration, creativity, and connection between it's residents. While private and co-working office space is still available, the vision of the brand is to build up and support the thriving entrepreneur. At Sandhouse the individuality and identity of each business is paramount. “We want to provide a curated experience for business owners by allowing them carte blanche when it comes to creating their space. Our private offices are fully customizable to foster unique brand identity. We want to see our members thrive by truly feeling at home here,” says Gerstein. As of July 2018, Sandhouse launches their soft opening and is ready to take on businesses looking to find a home that will help them grow. 247 secured access, unique events, happy hours, meeting rooms, lounge areas, and impressive amenities such as artisan coffee, tea and filtered water, are just a few of the things that makes Sandhouse a space you may never want to leave. Residency memberships are available starting at $250/monthly with Private offices starting at the $1000/month mark. Sandhouse can house a single person office all the way up to a fully staffed company requiring an entire floor. “ We want to change the game. Sandhouse is not simply a place to put your laptop, it’s a unique community for people trying to do something special, and why wouldn’t we want to be a part of that?”.